All four men in this CCTV video managed to escape alive after a massive landslide overtook their car in Yan'an City, China over the weekend. Watch what happens next in the video below. As you can see in the video below, the first two occupants made it out of the car almost immediately after the landslide stops. A third man made it out soon afterwards, and then the three rescued the fourth person inside, reports CNN. 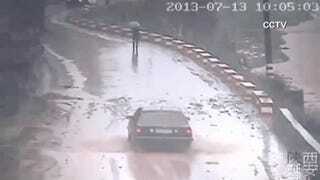 Rain storms in Shaanxi Province resulted in some three inches of rain in just two hours, causing the landslide itself.